It’s not like we take ourselves too seriously, but we do like to make a good impression. The warm welcome we’ve gotten from the predominantly straight Caps family seems to slightly outpace the tepid reception from teh gays (despite all those cute guys that turn up at Nellie’s for the watch parties). Maybe if we started using approved language like ‘LGBT’ instead of the kinda snarky Interweb shorthand like ‘teh gays,’ we’d make more headway. Whatevs. 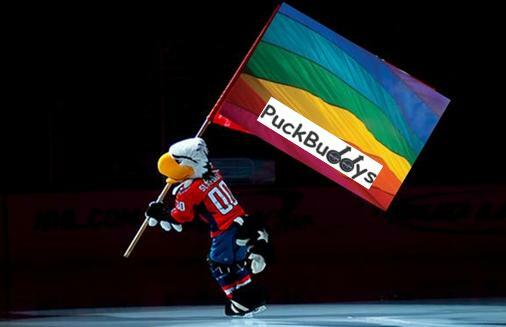 Tonight will be a test of just how charming we come across (or not) with our brethren and sistren as we hoist the Puck Buddys flag at SportsFest, DC’s largest networking affair for the gay sports set. We’ll see just what the man-on-the-street reaction is to this project of ours. This is Washington after all and how best to speak to fellow Washingtonians, be they straight or gay? In the universal language of a PowerPoint deck, of course. Fresh from our design team, a sneak-peek at what’s in store for 300 of our soon-to-be new best friends. With any luck, we’ll have a twenty-slide loop going that tells our story. Come by SportsFest at Room and Board (14th & T Streets, NW) tonight between 7 and 10pm and see the whole presentation (and us in our Caps sweaters) for yourself. We promise you this – it will be far less painful than a Florida condo time-share pitch.